A new poll from Ottawa-based Abacus Data shows that rising gas prices are affecting most Canadian family budgets and many Canadians are planning to make changes to their spending behaviour. Two thirds of respondents said they are angry and blame oil and gas companies for the increases. Almost eight in ten (79%) want governments to step in and do something. Over seven in ten Canadians surveyed (72%) said that rising gas prices have forced them to change their spending plans with 39% saying that price increases have “really hurt their budget”. Only 21% of respondents said that they have not been affected by the gas prices increases. 26% will change their summer or vacation plans. When asked why they felt gas prices are rising, almost all respondents said it was because of “greedy” oil and gas companies, while 47% cited the rising demand for oil. Another 46% noted the conflict in Libya as a cause while only 25% believed rising gas prices was related to improving economic conditions. More specifically, respondents were far more likely to blame the oil and gas companies for the rise in prices (68%) than the federal government (16%), Middle Eastern countries (15%), or their provincial government (4%). 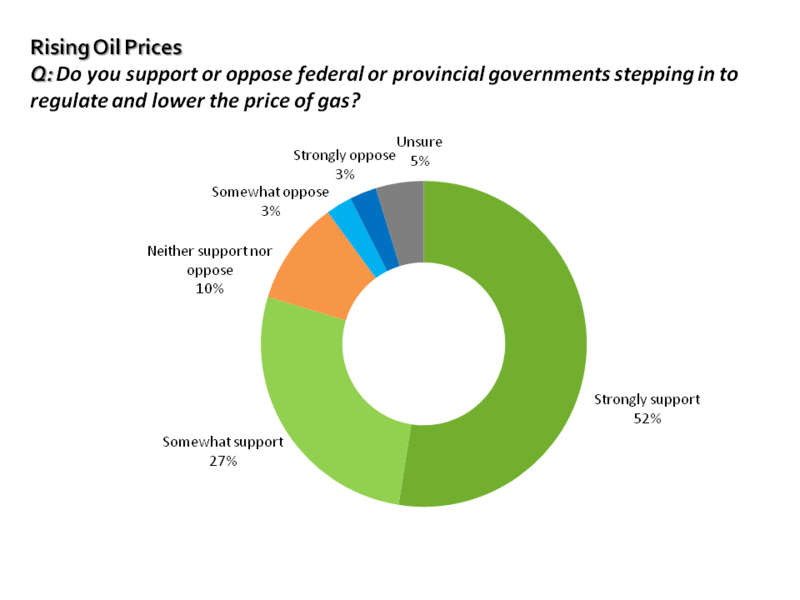 The Abacus Data survey found strong support for the federal government to step in and regulate gas prices. Almost eight in ten Canadians (79%) either strongly (52%) or somewhat supported (27%) the federal government stepping in to regulate and lower the price of gas. Only six percent of Canadians were opposed to the idea. Support was consistent across Canada, among all age groups, and even among various federal party supporters. Even eight in ten Conservative Party supporters said they would support government regulation of gas prices. Although this is not the first time that gas prices have spiked, Canadians are not yet resigned to the reality of $1.40 per litre gas. When asked which statement, if either, came closet to their view, two thirds of respondents (66%) said they were “pissed” because oil and gas companies are greedy and making a killing off consumers. Only 13% were resigned to the fact that gas prices will rise because it is a non-renewable resource.